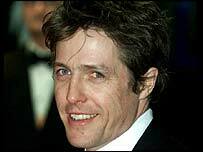 Hugh Grant and a businessman have paid £390,000 between them to dine with Sir Elton John. The Four Weddings and a Funeral actor was at an auction during Sir Elton's annual White Tie and Tiara ball, which was held at the singer's mansion, near Windsor, Berkshire. The lot gave the highest bidder the chance to invite 10 friends to the dinner party, hosted by Sir Elton and his partner, David Furnish. Grant agreed to up the ante to £200,000, if the rival bidder, who is not being named, promised to pay his £190,000 offer too. The auction - which included a Bentley Continental that fetched £320,000 - raised £930,000 in total for Sir Elton's Aids charity, the Elton John Aids Foundation. Sir Elton's spokesman Paul Carey said: "The bid for the dinner started at around £5,000 but went up and up and up. "Hugh came in at about £150,000 and this businessman eventually offered £190,000. "Hugh sat there and mulled it over for a couple of seconds. Then he said 'I'll give £200,000 if you give £190,000 and we'll split the amount of guests between us'." 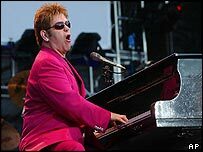 He added that Sir Elton was "delighted" with the result of the auction.